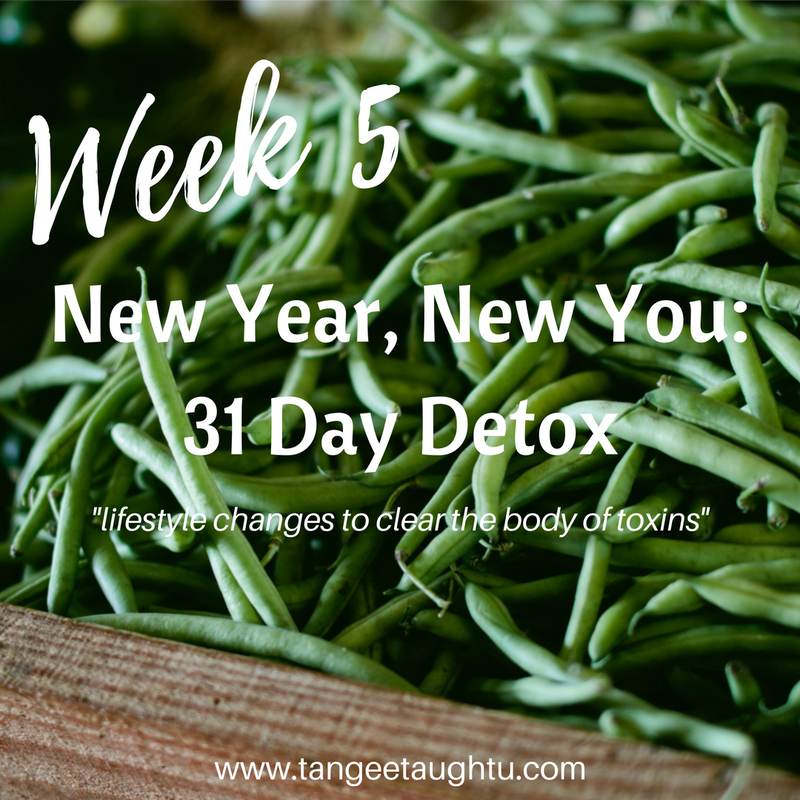 The last week of the New Year, New You: 31 Day Detox is here!!!! I can not believe it. I can say that I am so happy to have put this together and share it with those who are interested about healing from inside out. It has been 28 wonderful days. This is your Week 5 guide that will cover the meals and practices from Janaury 29, 2017 to January 31, 2017. Cook qunioa and brown rice according to package instructions. Preheat oven to high broil and place rack at top of your oven. Lightly brush whole poblana peppers with oil. Place on a baking sheet and broil on high 1-2 minutes on each side or until blistered. Turn off broiler and preheat oven to 375°F. Let peppers cool for a few minutes, then peel away any blistered skin and cut out the stem. Cut a slit down one side and remove seeds. Set aside. Heat a large metal or cast iron skillet over medium heat. Add 1 tbs oil and onion. Saute for 4-5 minutes, or until soft and translucent. Add cooked rice, 1/2 tsp cumin, 1/4 tsp salt, salsa, and cilantro. Stir to combine. In a separate saucepan over medium heat add pinto beads and season with 1/4 tsp cumin and salt. Once bubbly and hot set aside. Place peppers in a lightly greased, large baking dish and scoop generous amounts of the rice filling into each pepper using a spoon. Top with beans and a bit more salsa and cover the dish with foil. Bake peppers at 375°F. for 15 minutes, then remove foil and bake for another 10 minutes. Let cool slightly and add more salsa and cilantro if you want. Put avocado slices on the side. Enjoy! Using a sharp knife cut both ends off the plantain. This will make it easy to grab the skin of the plantains. Slit a shallow line down the long seam of the plantain; peel only as deep as the peel. Remove plantain peel by pulling back. See previous post Plantains. Place plantains on tray and lightly spray, bake for a about 15, turn and bake on the other side for another 15 minutes or until golden brown and tender. While the plantains are baking, add 2 tablespoon of oil to a saucepan, followed by onions, garlic and tomatoes. Let it simmer for about 5-7 minutes, stirring frequently to prevent burning, add about 2 tablespoons or more of water if needed. Then, add beans and continue cooking for about 5-7 or more minutes. Remove baked plantains from oven cool for a couple of minutes; make a horizontal slit in the plantains, stuff with equal amounts of beans mixture. Enjoy! Mash together the chickpeas, mayo, and mustard. Do this until the chickpeas are mostly smooth but still slightly chunky. Add the relish, celery, salt & pepper. Create your sliders with the chickpea salad and garnish with lettuce and tomatoes on whole wheat slider buns. Enjoy!